No doubt the president would like to see his legacy honored by Macron, who shares his view of what needs to be done to reform the French economy. And he surely feels no warmth toward Hamon, whose vote to censure the Valls government shocked him (as Davet and Lhomme also tell us). The problem is that Jean-Claude Cambadélis has warned that any Socialist supporting Macron rather than the party's official candidate Hamon will be expelled. Since a substantial majority of deputies and other party officials prefer Macron, this will be a difficult order to enforce. The embrace pictured above thus represents the inevitable disintegration of the party formerly known as Socialist, now en marche for destinations unknown. Another fine mess the PS has gotten itself into. François Bayrou, recognizing that the "dispersion" of political programs would increase the risk of a Le Pen victory, proposes an "alliance" with Emmanuel Macron. He also laid out a series of "exigences" that Macron would have to meet. Marine Le Pen is advocating an end to the euro and withdrawal from the EU if she wins. How much would this cost the French economy. The Institut Montaigne estimates a loss of 500,000 jobs and numerous other dire consequences. In 2012 Le Pen lagged behind with female voters, winning 17 percent compared with 20 percent of men’s ballots. Now she’s closed that gender gap, attracting 26 percent of voters of both sexes, according of pollster Ifop. That makes her the favored candidate among women for the first round. Brice Teinturier, the head of the polling firm IPSOS, was interviewed on France Inter this morning about his new book Plus rien à faire, plus rien à foutre. As he tells it, large numbers of French people--32% of the electorate, according to his most recent estimate--are completely turned off of politics (and skeptical of democracy). These are not angry voters of the sort who support Le Pen and Mélenchon. They're rather turned-off voters, who believe that the decisions of politicians make no difference in their lives and that political talk is all hot air. The increase in their number is, according to Teinturier, one of the reasons underlying the diminished capacity of political parties to organize the electorate. Underlying Teinturier's observations is a theory. It goes like this. The period 2007-2017 has been unprecedented in the history of the Fifth Republic, in that it offered an alternation between a pure right-wing quinquennat and a pure left-wing one. In short, both the center-left and the center-right had a chance, undiluted by cohabitation, to show what they could do, and neither provided a solution to the problems perceived by the PRAF (plus rien à foutre ... avec la politique) group to be the major difficulties of the moment. Hence they turned off, drawing the conclusion that the choice between right and left no longer determined their fate. 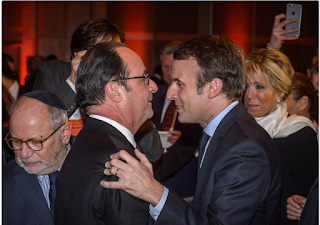 Their disillusionment was exacerbated by the fact that it followed a moment of renewed hope for each camp, Sarkozy briefly reinvigorating the right after years of the fainéant Chirac and Hollande briefly reinvigorating the left. If these voters are drawn back in, Teinturier believes, it will be by one of the extremes, Mélenchon or Le Pen, and most likely the latter. Macron does not fit the profile: his voters are not turned off by politics but are highly tuned in, identify with the decision-making class, and believe that their choice will matter. I would not have guessed that the turned-off portion of the population was as large as Teinturier says it is, but I do think he's on to something.